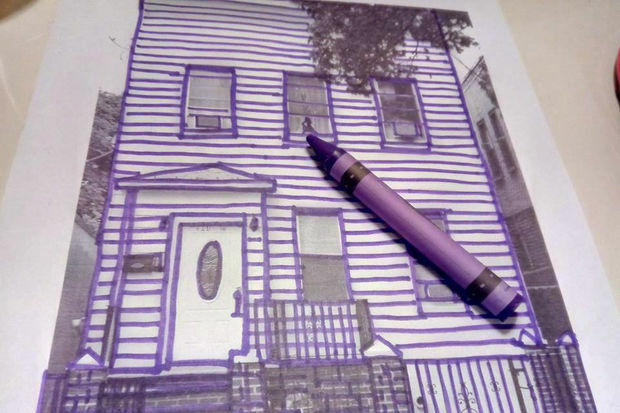 The preservation society in Corona and East Elmhurst launched a letter-writing campaign in crayon. CORONA — A local historical society is digging into the crayon box to save a home where a famous children's book author lived — which was coincidentally purchased years ago by the Queens Borough Public Library with plans to tear it down and expand. He spent his elementary and high school years in an apartment inside the white two-story Italianate house before the 7 train was built and when the block was called Ferguson Street, according to the preservationists. Library officials, unaware a children's book author once lived inside, bought the home for $770,000 in 2013, city records show. They've been renting the residences out to families ever since but plan to eventually tear it down and expand the bustling Corona library on the lot. CEEHPS, with help from local schools and other historical societies, is now hoping to save the house from the wrecking ball. They've worked on campaigns to landmark Dizzy Gillespie's home as well as the Dorie Miller Apartments, which was the city's first integrated co-op. "It's a historic building, and we're asking them not to tear it down," Carol Drew, the group's president, told DNAinfo New York. Last winter the group discovered Johnson had lived there and they wrote a letter to Queens Library's CEO Dennis Walcott, who told them in a letter he couldn't promise the building would be saved. Attendance at the tiny library, built in 1968, was more than 240,000 between June 2015 and June 2016 — and has steadily increased since, Walcott wrote. Continuing to provide services in the 8,000-square-foot building would be "unsustainable." "If we want to continue to be an outstanding library system that meets the needs of all of those who enter our doors, we must explore every available avenue to satisfy their requirements and accommodate this growing community, while simultaneously preserving the character of the neighborhood," he said. CEEHPS members decided to launch a public letter-writing campaign this weekend to put the pressure on the library to keep the building. Drew said they haven't heard back from the library since January and want to let the community know of the home's significance. Students are writing simple message — "Please save Harold's house" — in purple crayon, Harold's favorite way to dream up new worlds. Emails are also being sent to Walcott — in purple font. "We're not asking them not to use the house," Drew said. "What we'd like to see them do is connect it to the existing building and make it a children's library. You could have a children's meditation park in the backyard. There's so many things that can be done with the building."